The LM1000 is a highly precise compact step tester for the electrical test of HDI bare boards in mass production. It’s unique concept – based on solid granite – delivers highest accuracy. Two high resolution cameras (top and bottom) scan the bare board and enable the automatic micro adjustment of the fixtures to the correct position. The dual shuttle and a dual vacuum handler – driven by fast linear motors – provide high throughput multi-tasking product handling. 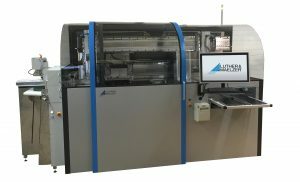 The machine runs either with universal fixtures up to 6.4″ x 9.6″ test area or with a dedicated fixture. This gives customer the possibility to choose the best price-performance technology for the specific application without being limited by the equipment.